For local terroir, we use spelt grown in Upstate NY and malted by our friend Andrea Stanley at Valley Malt. GOLDEN HOUR is the light at the end of the tunnel. Following in the authentic tradition of Belgian saisons, ours is dry and spritzy with a billowy white head of Belgian lace. With its subtle nutty flavor, the spelt combines beautifully with the spiciness of our favorite farmhouse yeast and the refined, pungent aromas of German Tettnang and Hallertau hops. 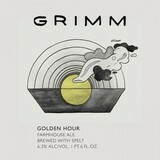 Golden Hour is a beer for those seeking respite from the winter doldrums.